August 28, 2014 - An Elite Medical Transport twin-engine CESSNA 421C aircraft (N51RX) crashed on Wednesday killing a cancer patient and three others onboard. The aircraft had just departed Las Cruces International Airport, New Mexico for Phoenix. Several witnesses reported the aircraft was flying low when it hit a mesquite tree, flipped and burst into flames. Many of these witnesses were law enforcement officers and cadets who were at the nearby Butterfield Shooting Range. Weather conditions were reported to be VFR. The crew members all from El Paso, Texas have been identified as Freddy Martinez 29-year-old pilot, Tauren Summers 27-year-old flight paramedic and Monica Chavez 35-year-old flight nurse. The patient was identified as Fredrick Green 59-year-old. Green who was an auto mechanic was suffering from a brain tumor and was undergoing radiation treatment in Las Cruces. Green’s condition had deteriorated and doctors felt that he should return back to St. Joseph's Hospital and Medical Center, where he was originally treated. Green’s brother, Frederick said Green the family had a choice on Wednesday to put his brother on a plane immediately or wait four hours. He further stated "I kind of wish we had waited, but you can't change what happened." The brother further stated the family did not learn of the crash until he called St. Joseph's Hospital and Medical Center to check on his brother's condition. 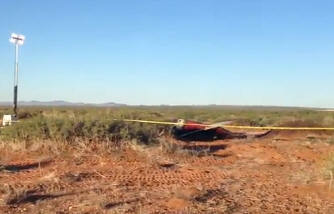 New Mexico State police reported the aircraft belonged to Amigos Aviation and was contracted by Elite Medical Transport. Elite Medical President Rob Campion said the company was "deeply grieved by the loss of the patient and our friends and co-workers." Update- September 8, 2014 A post accident review of refueling records and interviews with line service technicians showed that the airplane had been missed fuelled with 40 gallons of Jet A fuel instead of the required 100LL aviation gasoline. - The line service technician drove the fuel truck to the front of the airplane and refueled the airplane putting 20 gallons in each wing. The pilot then assisted the line service technician with replacing both fuel caps. They both walked into the office and the pilot signed the machine printed fuel ticket.